Today TWG was notified that the Public Hearing for the FY16 budget and the meeting to set the millage rate that was scheduled for this Thursday, June 25th at 6:00PM has been canceled and rescheduled for Monday, July 6 at 6:00PM. This is not a BOC error. 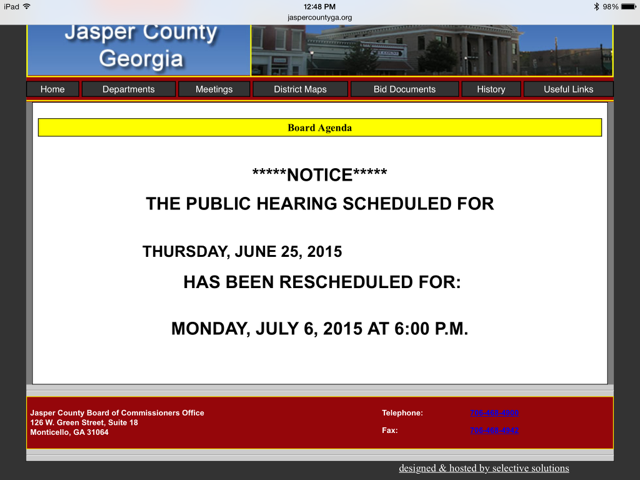 The local paper did not run one of the required county tax ads last week, so the 3rd public hearing has to be rescheduled to follow state law. We are unsure of the date of the Landfill Committee Presentation due to the deadline of June 30th in the EPD consent order. Citizens need to be able to have time to know about and attend any meeting concerning the landfill. The BOC needs to be aware that citizens are still concerned about the recent BOC proposals concerning the landfill. TWG continues to urge citizens to attend the landfill committee presentation whenever it is held. We will update you as soon as we know more and have a confirmed date for the Landfill Committee Presentation. Please share this with others so they are aware of the cancellation. This entry was posted in Budgets, County, Open Government, Property taxes and tagged Jasper County GA, Landfill committee, Public hearing. Bookmark the permalink. I support increased spending funded by higher taxes, because I have to pay for two hundred satellite TV channels, but only watch five.